Public speaking doesn’t come naturally to everyone. You may have the ideas, impeccable language , great creativity; but in front of more than two people and you may freeze. But ambition comes at the cost of overcoming hesitations. If you want to be noticed, then it’s time to step up on your presentation skills. Okay, the above picture is an exaggeration, but there is nothing worse than being met with drowsy, blank looks while putting forth your work of genius. 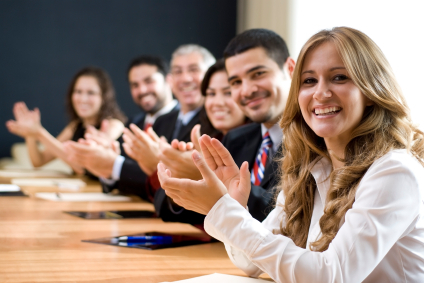 Below are a few small things people tend to forget while presenting in a meeting. Even the most intense statistician needs a break, right? Your presentation may have its facts and figures in place; but there is such a thing as an overload of numbers. Unless, of course, you are Sheldon Cooper from the Big Bang Theory! Make sure your presentation clicks on an emotional level. Talk about how it will actually affect another human being, rather than being just another calculated figure. You know you are giving your A game if what you speak evokes varied reactions from your audience. As long as it’s not a muffled, fighting the urge to yawn kind of reaction, you are doing well. Personal examples work rather well. Or an anecdote on the hurdles you encountered while coming up with your plan and its execution. A small story linking the subject matter is usually a good way to capture the attention at the beginning of the presentation. Very few things work as wonderfully as a person on the mike with a great sense of humour. I emphasize on ‘great’ because, humour is rather subjective. It can go disastrously wrong. If you are not certain, then steer clear of it. If you make a couple of punches at your own expense and a trusted colleague, or incorporate a few lines of an overheard joke into your subject matter, it will improve the audience’s attention and keep them glued to what you say. 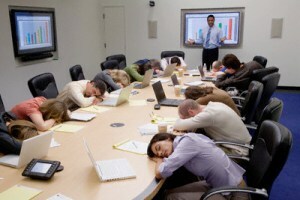 Granted that a Power Point presentation is indeed a great tool, but it is not the only mode of presenting. You need to decide on what will be most suitable for the subject you are touching upon. At times, you don’t even need anything but a great command over your speech and ideas. Research a bit and see what would be the most creative way to put forth your idea in the board room. Next time you are asked to stand up and present, go and act as if you own it, the meeting, the audience, the paper, everything. But remember, confidence needs to be backed up with substance too!